Check out more $5 albums here! On this album they've layered the sound up with dusty cloaks of reverb and echo and created a hillbilly noir classic. It's the Cramps, Dock Boggs, and Hasil Adkins all fronted by the hypnotizing vocals of Melissa Swingle. For their third record, High Seas, they've layered the sound up with dusty cloaks of reverb and echo and created a hillbilly noir classic. Swingle's dusky vocals riding atop layers of moaning, swirling guitars, weird wah-wah pedal banjo and ethereal saw playing, wrap the melancholy, hypnotic longing carried by folks with the whiff of a lost soul. It's got love songs to clog-dancing folk hero Jesco ("Jesco"), chiggers and all them other bugs that bite ("Itchin For You"), and the hillbilly sea shanty of "High Seas." 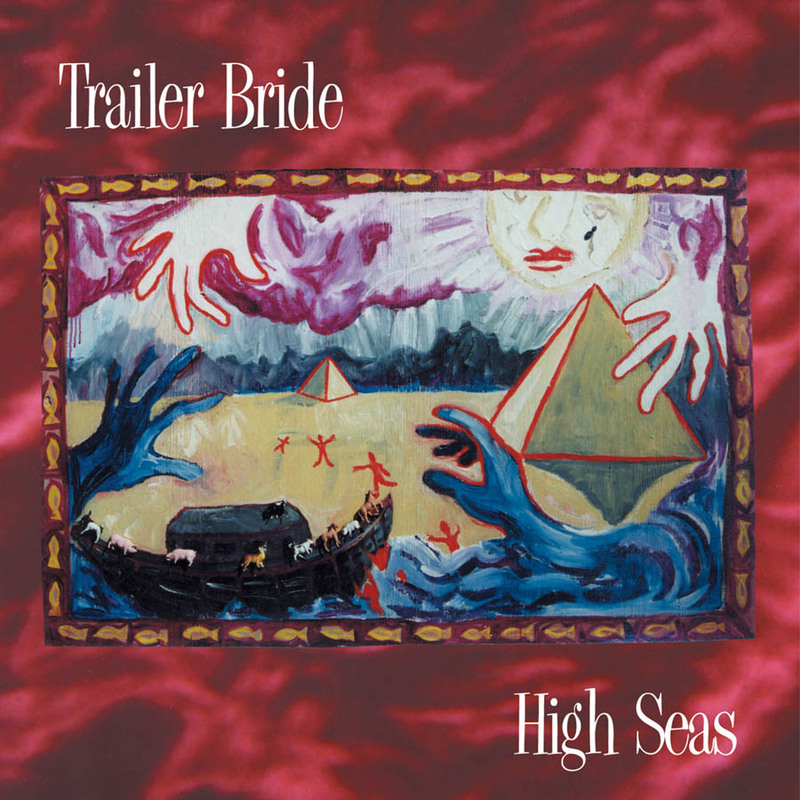 Trailer Bride is the spookiest, sexiest, catchiest band ever. Let them cast their spell on you. ... too graceful to be campy, and chilling ballads are orchestrated perfectly to pluck at you like branches in the dark. A spooky, swampy triumph. The lyrics fall somewhere between the gothic textures of Flannery O'Connor and the cosmic ramblings of a junkyard dealer who's huffed too much gasoline while listening to Tom Waits records. Swingle spins tales of dancing outlaws and avenging ghosts that'd scare the bejesus out of even the most stoic listeners. The band takes it all in stride, though, playing reverb-laden death waltzes and hypnotic hymns. It's one of the year's best. Trailer Bride, "Hope Is A Thing With Feathers"
With her high-lonesome warble, and trademark slide-guitar mojo, Melissa Swingle sings sweet songs of love, but also delivers the goods to satisfy your dark side. Debut CD is rife with jittery hillbilly noir from the piney woods of North Carolina. Full of dark, Old World rhythms, artful gypsy punk and giddy spy-jazz. Channels street corners on the wrong side of town with existential blues, garage rock and instrumentals that’d find a happy home in a Tarantino spy flick. Is That You In The Blue? A sometimes sparse, sometimes exuberant blend of folk, deep country and wide-open spaces from this co-founding member of punk legends X. Subdued, but no less edgy. Thirteen dusty gems flirting with the static-y ghosts of Motown, Tin Pan Alley, classic pop, and soul; dancing across the radio spectrum like a trail of mileposts in the rearview. An irresistible match between the Harry Smith creak of our American musical backwaters and the easy-on-the-way-down psychedelic vibe of the Fairport Convention and Buffalo Springfield. Jim & Jennie make you feel like they're your traveling companions through the past and into what is to be. On this album, TMP has distilled their attack down to the essentials: three parts liquid nitro, three parts stare-into-the-bottom-of-the-glass heartbreak, and four parts Let's Take It Outside, Short Pants. Only the choicest cuts of surf, bluegrass, spaghetti western spookiness, garage punk, country murder ballads, and gospel.